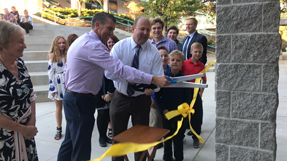 Pictured (left to right): Tagg Neal, Rescue Union School District Board Member, and Tony DeVille Jr. cut the ribbon to dedicate the new building. Nancy Brownell, Rescue Union School District Board President, expressed, "We on the Rescue Board are incredibly grateful to Tony and his family for his years of service and dedication to our students collectively and for several of us to our own children as well. His commitment to making a difference in the lives of so many students and families by developing our curiosity, character, and courage to accomplish great things for ourselves and others was remarkable."